The nearest neighbor method makes only limited assumptions about the model and data. Iterative search functions solve nearest neighbor problems. The resulting model fit is very flexible in shape, predictions are usually accurate, but prone to instability. For example, Figure 1 shows a scatter plot of training data on the input pair and , each of which has a 100 points. The random data can be used to define the output class variable , which sets the color of the background grid with the values and . with no intercept term and equal to or depending on the class. The regression line defines the decision boundary given by . In summary, the background grid is shaded in Figure 1 given the classification defined by ( ). 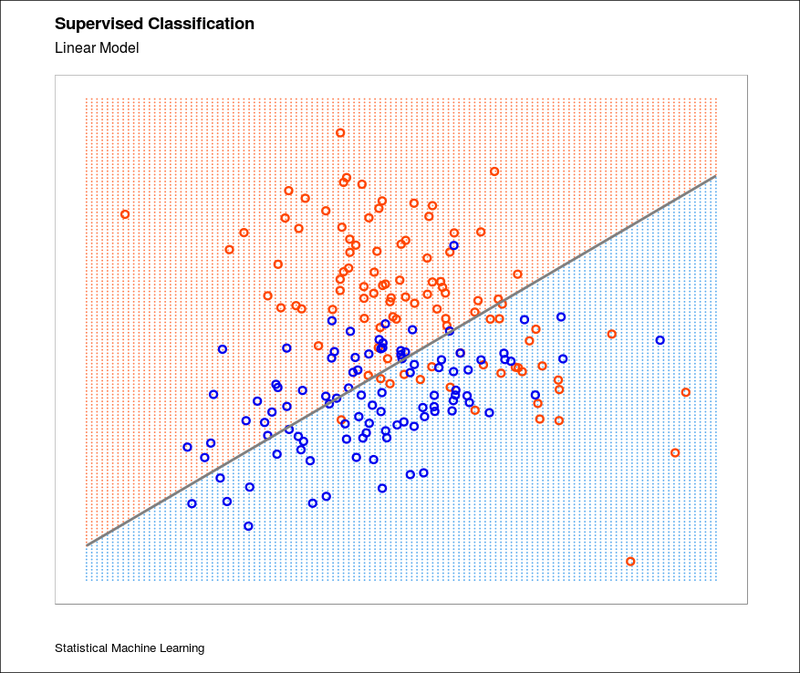 Its clear, however, that there are several mis-classifications in the data on both sides of the linear decision boundary in Figure 1. As a result, the decision boundary is too inflexible. More likely, the optimal decision boundary is non-linear and maybe disjoint in nature. where is the neighborhood of with the closest points in . Closeness implies a metric, which for simplicity is Euclidean distance. So, in words, we find the observations for the feature grid point closest to in the input space, and average their responses. In Figure 2, the training data is the same as that in Figure 1. However, the feature space is now classified using the average class of the 25-nearest-neighbors given equation ( ) as the method of fitting. It is now obvious that the decision boundary that separates the from the region is far more irregular, and responds to local clusters and outliers where one class dominates. Asa result, in Figure 2, with , there are far fewer training observations that are misclassified than in Figure 1. 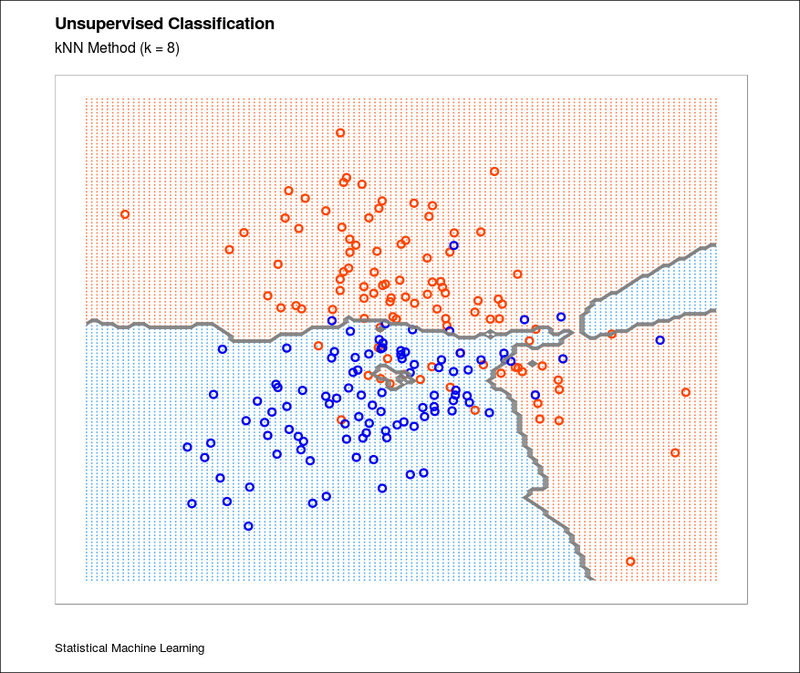 This doesn’t give much comfort, though, since the classification boundary is still prone to errors. in Figure 3, with , we now see less errors. 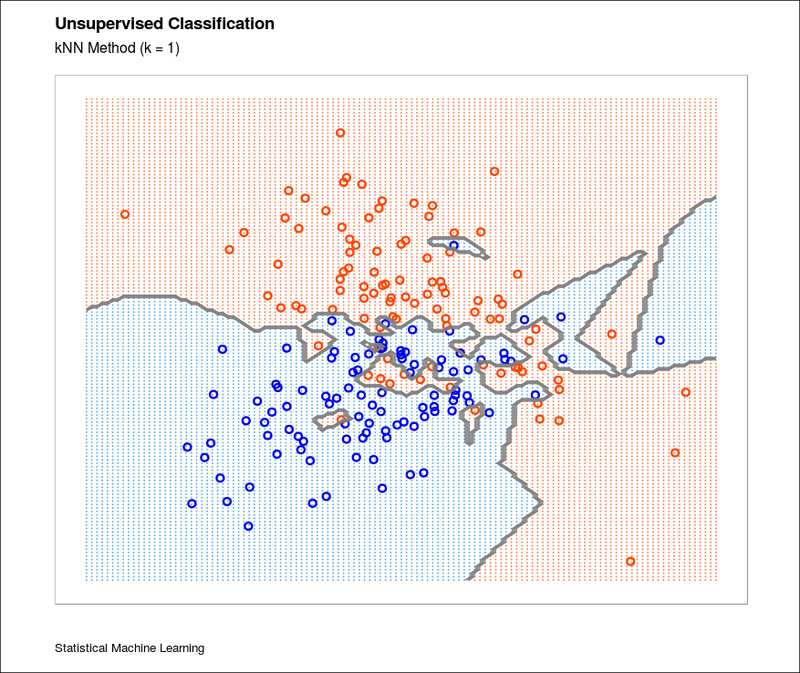 The classification boundary also has disjoint islands to help separate the data. 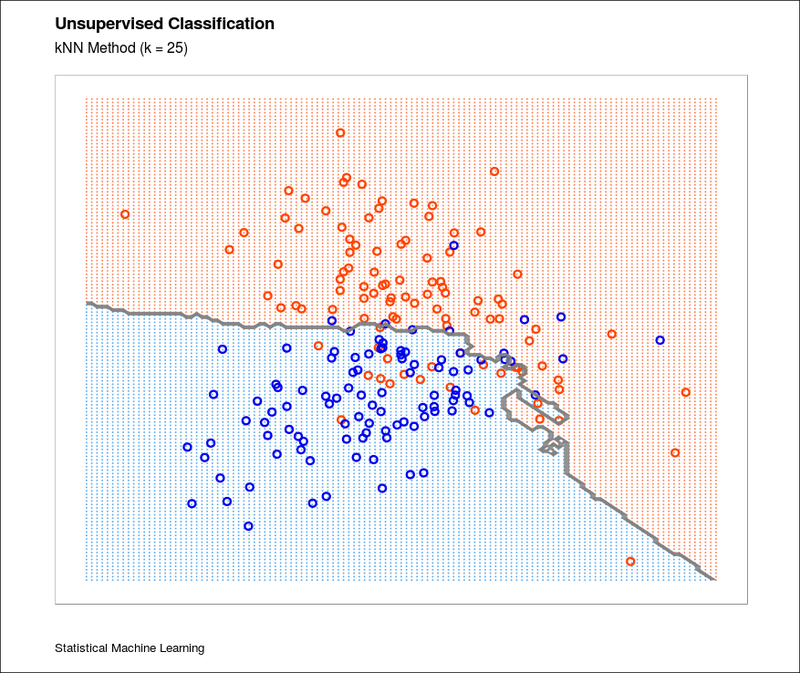 In figure 4, none of the training data are misclassified with . A little thought suggests that for k-nearest-neighbor fits, the error on the training data should be an increasing function of , and will always be 0 for . The -nearest-neighbor fits have a single parameter, the number of neighbors, . Linear least squares relies on , the number of model parameters. The number of parameters for -nearest neighbors is . This is generally much bigger than , and decreases with increasing . To get an idea of why, note that if the neighborhoods were nonoverlapping, there would be neighborhoods and we would fit one parameter (a mean) in each neighborhood. 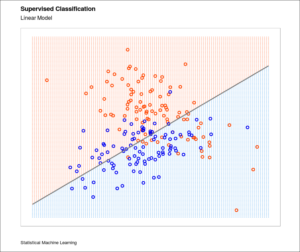 Finally, unlike linear least squares, the sum-of-squared errors on the training set has no merit as a criterion for picking in the nearest neighbor method, since we would always pick as the best answer. However, the boundary for any solution with a low value is unstable, complex and noisy. This entry was posted in Data Science, Modeling, R Programming, Website. Bookmark the permalink.